2015 is winding down and 2016 will be in full swing before we know it. This past year was very crazy for my wife and I and we're both ready to move forward into 2016 and get back on track. Financially it was fairly difficult and we ended up taking some steps backwards on our road to financial independence but we would have gladly taken much bigger steps back if it would have meant things would have turned out differently. The new year is traditionally the time when people make resolutions for the coming year. Typically resolutions center around health and wealth; however, if you ask the average person about their resolution there's very little meat to them. A typical answer is something along the lines of lose weight, save more, or something else that is just too broad to keep their focus for more than a few weeks. That's why you'll see the gyms packed in the first days of the new year but slowly see the headcount drop as the month marches on. To maintain your focus and insure that you make progress on your resolutions you need to set S.M.A.R.T. goals. 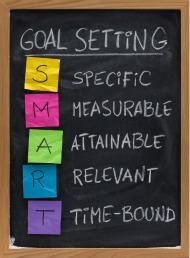 SMART goals are Specific goals that are Measurable, Attainable, Relevant, and Time-bound. The reason you need to set Specific goals is so you can avoid losing focus. A general goal like lose weight loses its luster after a few short weeks. So instead of a goal of lose weight your goal could be something along the lines of lose 1 pound per month. 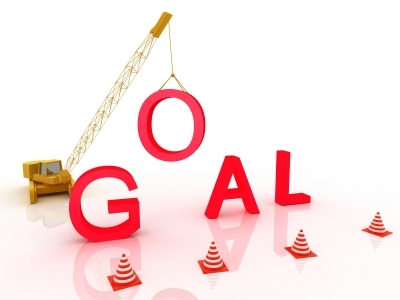 Measurable goals tie in with the specific requirement of SMART goals. The importance of measurable goals is so you can track your progress, otherwise, how would you know if what you were doing was working or whether you needed to change your approach. The Attainable factor is very important as well. It wouldn't be very realistic to become a millionaire over a short time. Our net worth is currently just over $400k. While that's a great start towards us being millionaires in the future, I can't really see any way that we could hit that mark by the end of 2016. Although you also want to make sure that your goals do push along and aren't too easy to reach. Relevant goals are probably the easiest one to cross off. Relevant goals are just ones that are worthwhile for you to pursue. Although you also need to make sure that your goals don't conflict with each other. The Time factor is last but not least among the SMART goal requirements. Your goals need to have a specific time frame to keep you on target. Otherwise it's too easy for other things to take away your attention from what you really want to accomplish during the year. The benefit of setting SMART goals is that they are very focused. Due to the very specific nature of the goals you must come up with a plan to accomplish your goals. SMART goals are also very easy to track and if you need daily motivation you can easily make a chart and put it in your home office, bedroom, or any other place that you can see it. When setting goals you also need to set aside time to check in on your goals. Whether it's weekly, monthly, quarterly, or semi-monthly. This allows you to see if there's something you're slacking on or if you need to change how you attack your goals. My wife and I are still crunching the numbers on what we expect to be able to achieve financially this coming year. 2016 looks like it's going to be another transition year which will slow down our progress a bit towards financial independence. Over the next couple weeks I'll be getting up a post with our official goals for 2016 so be on the lookout for it! Do you use SMART Goals when setting goals for each year? It has been a very tough year for you guys. And I am not surprised that financially its been a step back. But Im sure you guys are looking forward to the new year and wish you the best. Looking forward to your goals for 2016. 2015 was a difficult year and I'm happy with how things turned out financially. We essentially were able to tread water which is fine by me considering we took 8-9 months off from money related issues. We might change our approach a bit for 2016 which isn't exactly how I'd like to go because I'm anxious to get back to investing heavily but we might have to slow that down a bit. Have a great new year! And best of luck in 2016! PIP, all the best to you for 2016. New year and New opportunities. My thoughts were with you guys through the highs and lows of this year. I hope 2016 will be a better year for you, best wishes for the new year! My biggest goal for 2016 is to increase both my income and my job security. Thanks for sharing your thoughts on S.M.A.R.T goals -- the acronym is certainly better than the one I use with my sons: B-HAGs (big hairy audacious goals). This past year or so has been very difficult for you and your wife. Take care of each other and blessings for 2016! I really hope you will have a better 2016. I look forward to your goals post and wish you luck in achieving them all. Happy New Year PIP. Thanks for your blog and I appreciate it. We're always support you. Do your thing and keep it up, stay strong. A brand new chapter in your lives. Whatever has happened has happened and we can only look towards tommorow now. Enjoy the ride my friend. Cheers.